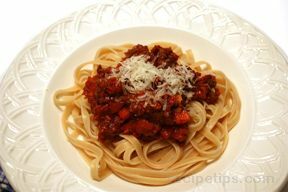 Bolognese sauce, thick with meat and vegetables, has intense flavors developed by long, slow cooking. Cook the bacon (medium-low) until crisp. Remove bacon, leaving fat in pan. Mix ground beef with 1/2 teaspoon salt and a few grinds of black pepper. Raise heat under skillet to medium-high and crumble the meat into the skillet. Brown lightly, then scoop out most of the meat, leaving some (about 1/4 of the total) to get dark brown. Put this meat in with the lightly browned, and discard all but 2 tablespoons of fat. Add the vegetables to fat in skillet and cook , stirring occasionally, until they soften - about 5 minutes, then add them to the meat. Add wine to skillet, raise heat to high, and boil until there is just a thin layer on the bottom of the pan, stirring to dissolve any browned bits. Add milk or cream and simmer for another 10 - 15 minutes. Serve hot, over pasta, topped with grated cheese if desired.